Season Tickets for this event are available through our office at 503-232-2300 or online here! A season ticket represents a 40% savings off single ticket prices. Single Tickets for this event are available at Ticketmaster or PCPA Box Office. Dr. Weil explains what has gone wrong with the American way of health, from medical schools and insurance companies to pharmaceutical giants. Weil offers a realistic vision of how we can achieve optimum health. Associate Fellowship, the Program is now training doctors and nurse practitioners around the world. 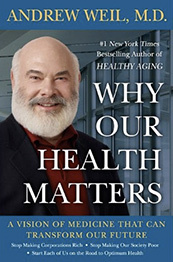 Named one of “the world’s 100 most influential people” by TIME magazine, Dr. Weil is the author of many scientific and popular articles and of ten books: The Natural Mind; The Marriage of the Sun and Moon; From Chocolate to Morphine (with Winifred Rosen); Health and Healing; Natural Health, Natural Medicine; and the international bestsellers, Spontaneous Healing and Eight Weeks to Optimum Health. His most recent books are Eating Well for Optimum Health: The Essential Guide to Food, Diet, and Nutrition and The Healthy Kitchen: Recipes for a Better Body, Life, and Spirit (with Rosie Daley). 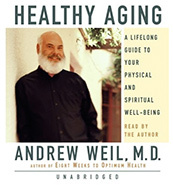 Five of Dr. Weil’s books were #1 New York Times bestsellers including Healthy Aging: A Lifelong Guide to Your Physical and Spiritual Well-Being, published in October 2005. His new book, Why Our Health Matters: A Vision of Medicine That Can Transform Our Future (Sept. '09), analyzes what has gone wrong with healthcare in America and offers a realistic vision of how we can achieve optimum health through personal responsibility and a new model of medicine. Dr. Weil also writes a monthly newsletter, Dr. Andrew Weil's Self Healing, maintains a popular website (www.drweil.com), writes a column for TIME magazine, as well as a monthly column for Prevention magazine and appears in video programs featured on PBS. In the past he has partnered with such companies as Origins, Waterford Wedgewood, Idea Sphere and Nature’s Path Foods promoting healthy products and services, and he currently serves as the Director of Integrative Health and Healing at Miraval Life in Balance Resort in Catalina, Arizona. A frequent lecturer and guest on talk shows, he has been a guest on Oprah, Good Morning America, NPR’s Fresh Air, The Today Show and many other shows. 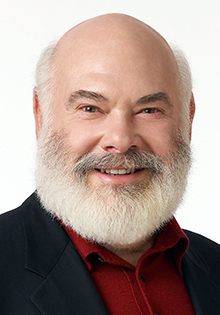 Dr. Weil is an internationally recognized expert on medicinal plants, alternative medicine, and the reform of medical education. He lives near Tucson Arizona, USA.